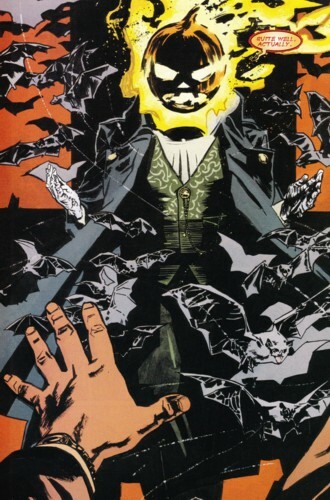 Powers/Abilities: Jack O'Lantern possessed the ability to alter people's perceptions. He may have also possessed other supernatural powers but these were unrevealed. (Civil War#5/Punisher War Journal II#1 - BTS) - Steven Levins was a mercenary who had battled Captain America on a number of occasions as Jack O'Lantern. He was forced to serve with the Thunderbolts during the conflicts over the Superhuman Registration Act. He was sent by Maria Hill to hunt down Spider-Man, but was shot in the head and killed by the Punisher. (Dark Reign: Made Men#1/3 (fb)) - Levins' brother, invited the fifteen year old daughter of his neighbor to wait at his house for her mother, as she was locked out of her own home. He told her the story of the original Jack O'Lantern, a man tricked by the Devil. At the end of the story, he slit her throat and drank her blood as part of a pact with Satan so that he could receive supernatural powers which he could use to avenge the death of his brother. He was taken into custody at New York's 63rd Precinct where he sat calmly drinking sodas and refusing to speak. (Dark Reign: Made Man#1/3) - Detectives Tom and Steve confronted Levins with pictures of the girl he had killed, but Levins simply confirmed he had killed the girl and then asked for another drink. Levins then recounted the story of what he had done to the girl and why. When asked how his pact with Satan turned out, Levins appeared in a new outfit with a flaming pumpkin for a head, surrounded by bats. The detectives shot 'Jack' through the head, but as he fell, all that was left on the floor was a set of empty clothes and hundreds of bugs. As the detectives wondered what happened, Levins, who was stood behind them with his arms folded, said he had just showed them who had the real power. Tom grabbed him and slammed his head into the table and said he was going to the electric chair. Levins responded that his 'dark lord' had assured him he just needed to wait and he would be free to leave. Seconds later a lawyer came into the room with an order signed by Norman Osborn stating that Levins needed to be released immediately as a material witness in a case involving national security. The lawyer and Levins drove away with Levins pledging his allegiance to Osborn. (Heroic Age: Villains#1 BTS) - Steve Rogers detailed in his journal what was known about the new Jack O'Lantern. 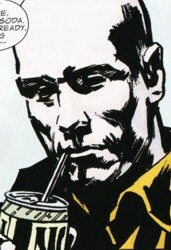 As Jack hadn't been used by Osborn, Rogers wondered whether Jack had reneged on his deal with Osborn and instead started his crusade on those responsible for his brother's death. (Venom II#11 - (fb) - BTS) - The Crime-Master's Jack O'Lantern told Venom (Flash Thompson) that he had killed all the other "jerks" that had worn Jack O'Lantern outfit, presumably including Levins. The Dark Reign comics introduced a number of new villains like the new Jack O'Lantern, the new Enforcer, Death Reaper, Gamma Corps and Zodiac yet none have really appeared again until Death Reaper in the Marvel NOW Gambit series. I thought this was an interesting twist to take the Jack O'Lantern character down the magical rather than technology based route and the character was creepily effective. It's a shame that we'll probably never see him again, though there's always a chance that the new Jack was lying or that Satan restores him to life. Satan is only referred to by that name in the story, so it is unknown which of the various entities in the Marvel Universe that have gone by this name, empowered Levins. Crime-Master's Jack O'Lantern claimed to have killed all the people who had previously used the mask however Jason Macendale and Steven Levins were already dead, so assuming Jack was telling the truth, then the Mad Jacks (Daniel Berkhart and Maguire Beck) are also likely, though, unconfirmed victims. (Dark Reign: Made Men#1/3) - Detectives at New York's 63rd Precinct who interrogated the brother of Steven Mark Levins (Jack O'Lantern) over the murder of his fifteen year old neighbor's daughter. 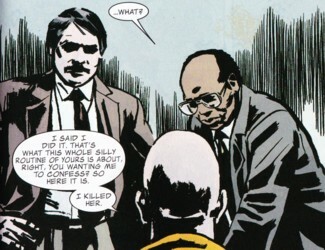 They intended to use a good cop/bad cop technique with Tom as bad cop, however as soon as he began, Levins confessed to the murder, explaining that he had made a pact with his 'dark master' Satan. When they didn't believe him, he altered their perceptions so they saw him as Jack O'Lantern with a flaming pumpkin head. The detectives shot and destroyed the head, however as the body fell, all that remained was a pile of clothes and hundreds of bugs. Levins dropped the illusion and Tom slammed his head into the table to get him back under control. At that point one of Norman Osborn's lawyers arrived with an order for Levins' release. Unable to prevent the child-murderer from leaving, Steve suggested that rather than worry over things they couldn't control, they should get drunk. In the picture, Tom is on the left and Steve on the right.